A complex of viral diseases with various manifestations such as lymphoid leukosis, myeloblastosis (see Sero-type J), erythroblastosis, osteopetrosis, myxosarcomas, fibrosarcomas, other tumours. It affects chickens worldwide with susceptibility varying considerably among different strains and types of stock - egg layers are generally more susceptible to lymphoid leukosis. Morbidity is low but mortality high. Mortality tends to be chronically higher than normal for a prolonged period. Egg production is somewhat reduced. There may be increased susceptibility to other infectious diseases due to damage to the immune system. Vertical transmission is most important by infection of the egg white in infected breeders (who are long-term carriers), lateral transmission is poor but infection may occur by the faecal-oral route, especially in young birds. In lymphoid leukosis the incubation period is about 4-6 months; it may be as short as 6 weeks for some of the other manifestations. The causative viruses are rapidly inactivated at ambient temperature and on exposure to most disinfectants. 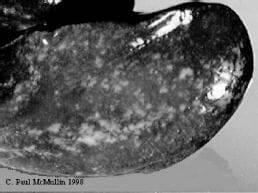 Focal grey to white tumours, initially in the bursa, then liver, spleen, kidney etc. Liver may be very large. History, age, lesions, cytology. Differentiate from Marek's disease, coligranuloma. Good hygiene, all-in/all-out production, control arthropods, eradication - checking of antigen in the albumen is a basis for eradication (see Sero-type J for details). Figure 9. Diffuse lymphoid tumours in an enlarged liver from a mature broiler parent hen. This was a case of Myelocytoma Avian Leukosis (Sero-type J).